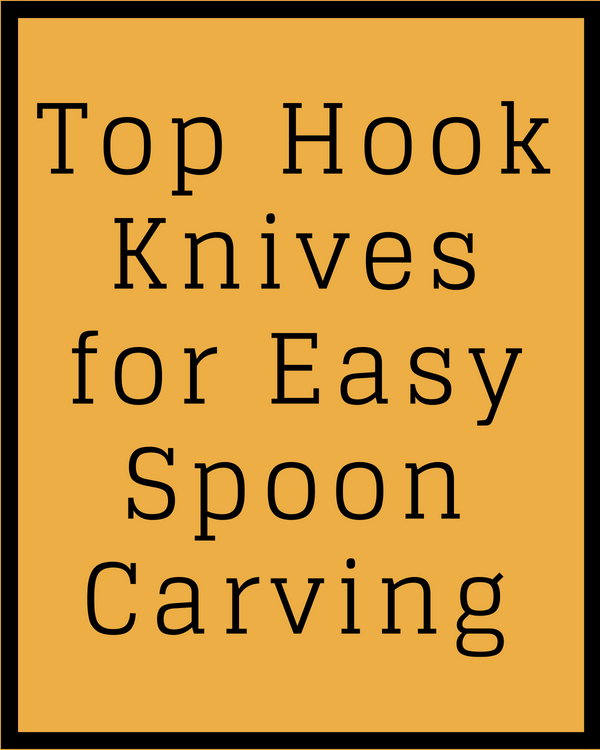 Something I really like about this method, and everyone reading will probably enjoy as well, is that you only need two knives to get yourself started, and wood of course. 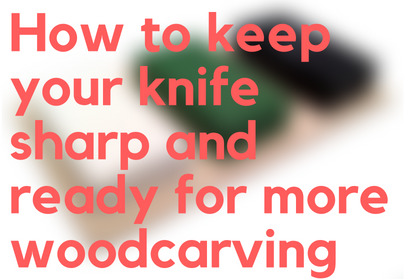 Today you’ll learn about the tools used for chip carving as well as, main cutting techniques, how to grip your knife, common patterns, and more to help get you started. This style of wood carving is used for creating aesthetic patterns and designs in wood. Primary Knife – You will be using this the most as it is used for chipping out most of the material. Inspecting the profile of the blade with a magnifying glass could be necessary if the knife has been used before or if it wasn’t sharpened already when bought. The blade should have no bevels (the horizontal or vertical slope that looks similar to an edge). Stab Knife – Effectively utilized as a specialty tool for making aesthetic markings. 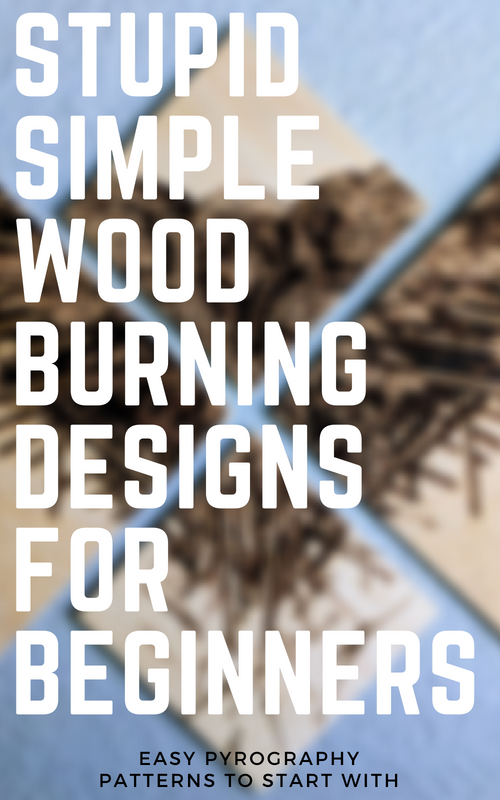 Wood – There’s a number of woods to choose from, but for beginners I’d suggest basswood since it is the easiest to work with. The durability of this knife is relieving seeing as how other knives in it’s price range tend to be cheaply made. Most lack in wood density that make the handle comfortable enough to use for long periods of time. It comes razor sharp and ready to use. To add, basswood is the most ideal wood to begin carving with so go grab a 8″ X 10″ panel to begin by clicking the button below. How Do I Sharpen My Chip Carving Tools? If there are bevels on either side of your primary, using a sharpening stone to trim them off will be required before beginning any projects. 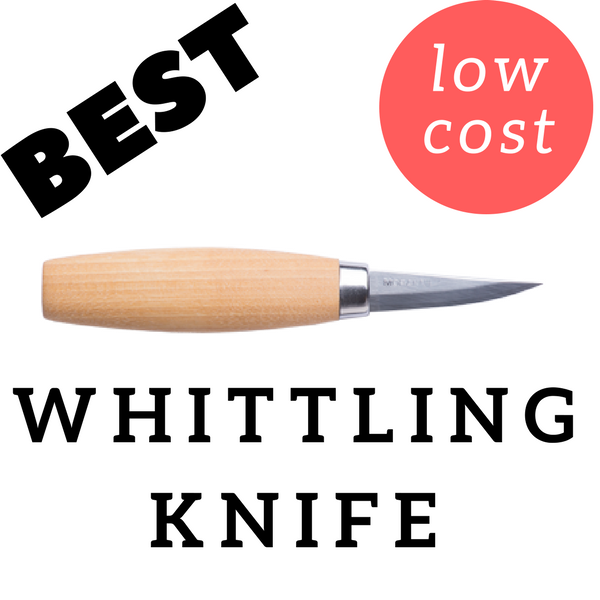 Sharpening chip carving tools differs slightly than sharpening regular whittling knives. To shave down the bevels it’s ideal to tip the blade at a 10-degree angle then rub it back and forth on the stone. You’ll want to work both sides of the blade the same number of times to avoid it being uneven. The 400 grit stone is to help remove the bevels so use this first then use the 1200 grit for polishing. Lastly, as far as sharpening goes, complete with a leather strop and honing compound. Be sure to hone the blade to the tip as this is to remove any small chips, a magnifying glass is helpful in this situation to be able to see if there are any left. During the process, be mindful not to break the blade otherwise you must restart all over. If your grip is off, then your cut is off. If your cut is off, your pattern is off. And if your pattern is off, well you see where I’m going with this. Grip the back part of the handle with your fingers and rest the thumb on the flat facet that’s on the front side of the handle just under the blade. 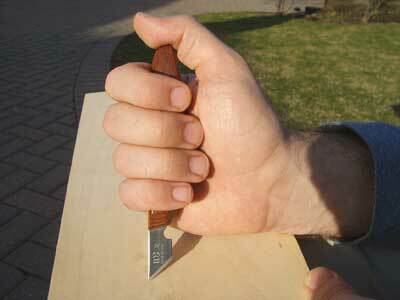 Keep thumb on the handle, NOT on the wood otherwise cutting yourself can become very easy to do! The alternative way positions the fingers around the front of the handle and the thumb rests on the back part of the blade. Both grip styles should be used cutting at a 65-degree angle. The stab knife is meant for making aesthetic “stabs” into the wood not necessarily meant for chipping out material. Chip carving patterns are found from these shapes. After getting familiar with them, it only becomes a matter of designing patterns and carving them. Set the wood on your lap to make it easier to turn the work piece and achieve optimal angles. If the wood is too big set it on a table. The two primary knife grips explained earlier are utilized for this technique. 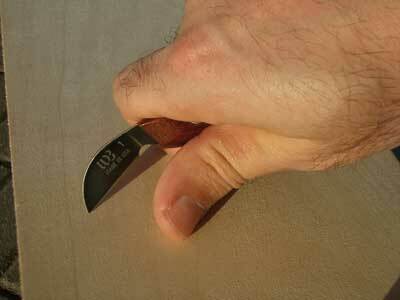 Plunge Cut – Start by piercing straight down into the wood with the point of your primary knife at a 65-degree angle. 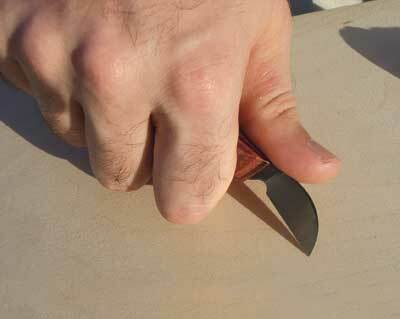 Once the point of your knife reaches the desired depth, slide the blade out of the work piece. Slicing Cut – Turn your work piece to a sufficient angle. Start the point of the knife where your last cut left off, start shallow with the cut on the baseline and go deeper to reach the point of depth the plunge cut created then draw the blade out slowly. Slicing Cut – Finish by doing another slicing cut. Begin where the second cut left off while making the shallow cut down to the point of depth and slide the blade out. The material should pop out with it. Do not pry out material if your cut does not bring it out, you will run the risk of breaking off the tip of your blade. Instead try cutting it again, except go deeper with the cut. 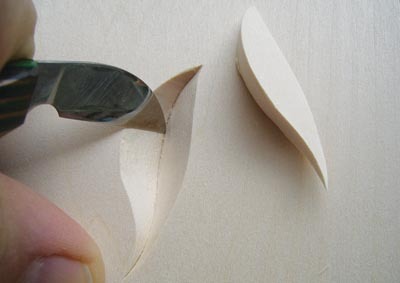 Straight Lines – Keep a firm grip of the item you are carving while making these cuts to provide stability. 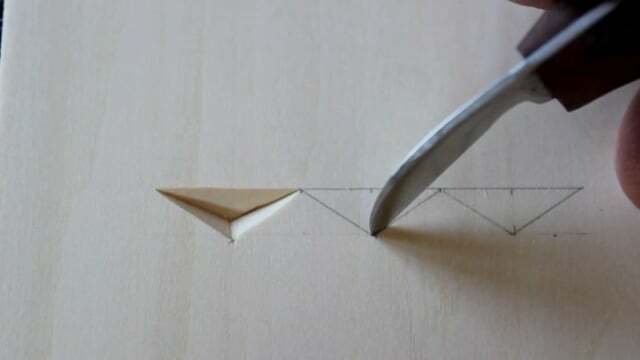 When finishing a stop cut, tip the knife up so your blade doesn’t surpass the designated mark. Something that has helped me with cutting clean straight lines is to look ahead of the blade and anticipate where it should go, NOT looking at the blade. Curved Lines – The blade is consistently kept at a 65-degree angle and because of this the wider the shapes makes for a deeper cut. Once the basic cutting styles have been perfected, you’ll probably be wanting to create original or more intricate designs. Rough surfaces for chip carving are very annoying, you’ll soon find out, since it can cause hesitation with your cuts and is also impossible to draw straight lines on. I use a 32 grit sandpaper which also is useful for taking pencil sketches out when the project is finished. How Do I Transfer a Design I Want to Carve on to Wood? This method is best with smaller patterns and also good to use on oddly shaped woods, as opposed to a regular square shape. Print a copy out of the design so you can use graphite paper to trace it onto the wood. Center the pattern to your preference then tape it onto the edge from one side. Next you will slide the graphite paper underneath the printed copy. Be sure to use a ruler or a different straight edged object and a hard pencil to maintain accuracy while marking along the edge. Once cutting is complete just erase the traced lines, using sandpaper helps. Practically all of chip carving is geometrical patterns which makes graphing an ideal and popular method. Mark the grid to the board with a small t-square, a ruler, and a hard pencil. Keep in mind that the size of each square unit determines the size of the final design. Your completed project will only be as precise as your pencil marking so take your time and be patient while creating the grid. What sharpening stone should I use to shave the bevels off the primary knife? I use the Smith’s TRI-6 Arkansas. It has 3 stones which rotate around pretty easily. Comes with 400 grit, 600 grit, and 1200 grit stones that offer any needs your knives will need from shaving off steel matter to honing a finer edge retention.